General Hospital (GH) spoilers for the week of Monday, April 15, 2019, through Friday, April 19, 2019 tease that we will have a week filled with two clashes, damage control is done, and let’s not forget plenty of drama. We have a very exciting week heading our way and you will not want to miss a moment of the action! This week, Franco Baldwin (Roger Howarth) and Cameron Spencer (William Lipton) will remain at odds. Cameron will get into a scuffle at school after a kid makes a homophobic slur about Aiden Spencer (Jason David). Elizabeth Webber (Rebecca Herbst) and Franco will have a talk with Cameron and lets him know that it is possible that his little brother might one day identify as gay. Cameron’s response will get under Franco’s skin and Franco will overreact a little bit leaving tension between him and Cameron. Do you GH fans think Cameron is having a hard time excepting things for what they really are? Meanwhile, Jason Morgan (Steve Burton) and Sam McCall (Kelly Monaco) will step up their efforts to neutralize Shiloh Archer (Coby Ryan McLaughlin). Sam will play it off to Shiloh like she is just as shocked by Kristina Davis’ (Lexi Ainsworth) disappearance as he is. As we all know Jason got Kristina out of the DOD house before her initiation and took the cup he found to have it analyzed. Jason will get help from Elizabeth Webber to make sure the cup is rushed to the lab. Shiloh will be there looking for Kristina at the hospital and will run into Brad Cooper who is analyzing the cup (Perry Shen) and recognizes the cup instantly. Shiloh will try to figure out a way of getting the cup before it’s too late and he is busted. Do you think he will be successful? 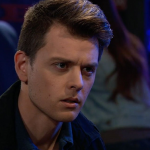 For the other residents of Port Charles, Michael Corinthos (Chad Duell) will put two and two together. Willow Tate (Katelyn MacMullen) offers help. Nina Reeves Cassadine (Michelle Stafford) will confront Valentin Cassadine (James Patrick Stuart). Sonny Corinthos (Maurice Benard) will disagree with Margaux Dawson (Elizabeth Hendrickson). Chase Harrison (Josh Swickard) will test the waters with Dr. Hamilton Finn (Michael Easton). Carly Corinthos (Laura Wright) will be moved to tears. Ava Jerome (Maura West) calls Scott Baldwin (Kin Shiner) for help.